Overall, sales in the City of Calgary have been higher than the long-term trends. It should be noted, however, that September saw less of an increase than July and August. According to Ann-Marie Lurie, who is the chief economist of CREB, this is likely due to the floods that helped to boost sales throughout July and August. Lurie believes the additional demand resulting from the floods started to ease up in September. Nonetheless, sales continue to remain elevated due to the short supply of rental properties coupled with the large number of people who continue to migrate to the city. 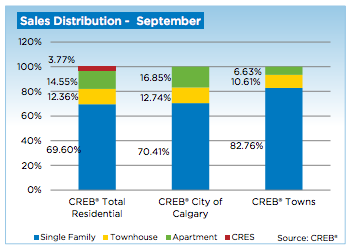 Over the past three months, Calgary has also seen an improvement in its new listings. This is a change from previous months, as the city has seen a decline in listings every month since 2011. While the growth was not significant enough to change the inventory levels, it has helped stop the market from growing even tighter. As a result, buyers have more choices available to them. Of course, the overall level of activity varies from community to community. Property type and price also has an impact on market activity. Those who are looking for a lower-priced single family home, for example, will likely need to consider purchasing a different type of property or moving to a different community. Despite the fact that Calgary’s housing market is considered a seller’s market, consumers are still looking out for the best deals. For this reason, the section within the low-range price market is low. Choices within the higher priced housing market, however, has improved. The condominium market also offers an alternative for those who wish to live in the city. After the first three quarters of the year, the condominium market saw 3,147 units sold. Townhouse sales also reached 2,494. This means the year-to-date growth of these two markets was more than double those within the single-family sector. Nonetheless, condo sales still represent less than one-third of all residential sales within the city. While single-family sales in 2013 kept in pace with 2012 sales during the first and second quarters, they increased by 6.7 percent during the third quarter to 13,006 units. In terms of prices, the tight market conditions have resulted in continued price growth within the Calgary market. The pace of this growth, however, did slow down in September. According to Lurie, if the level of new listings continues to improve as it has been, prices are likely to level off for the remainder of the year. Prices for condominium apartments increased by 9.5 percent to $272,900 when compared to 2012. This figure represents a 0.9 percent increase when compared to August. Single-family homes reached $463,700 and condominiums were at $299,100. These figures are similar to the August figures and are more than seven percent higher when compared to 2012.